Reverse Osmosis Drinking Water Systems (RO) are becoming a common method for treating contaminated drinking water. RO is probably best known for its use in desalination projects (which is turning seawater into drinking water). But, it is also effective for treating water quality problems in the home. RO can reduce organics, inorganic bacteria and many other things that can be found in contaminated drinking water. With the added option of reverse osmosis with a UV light you can even kill harmful bacteria such as ecoli and coliform contaminated drinking water supplies. The most common use for reverse osmosis filtration systems is to remove the large amounts of sodium (From salt) in the water that water softeners produce. You should never drink the water from ANY water softener! The first step toward fixing a suspected water quality problem is to call one of our 1 on 1 expert technicians so that they can help you determine what the proper water filtration system is for your particular situation. Many times they can give you great advice on how to spend less money on a better result. Their job is to get you the best equipment at the lowest possible price. They work for you. They do not work on commission and are never allowed to ask you to buy anything. They just give you great advice and answer all of your questions. 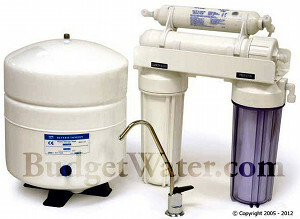 The basic components of an RO system include a pre-filter to remove things such as rust and lime; an RO module containing the membrane; an activated carbon post-filter to remove residual taste and odor, a storage tank; and several valves, including a shut-off valve that stops the water flow when the storage tank is full. Pre-filters containing activated carbon are usually used to protect chlorine-sensitive membranes. Our Reverse Osmosis Systems can remove sodium, salt, nitrates, fluoride, lead, heavy metals, cysts, cryptosporidium, bacteria, tastes, odors, THMs, chlorine, radium, dissolved solids, pharmaceuticals and much more. Private Well (Non chlorinated) or City Water (Chlorinated)? If you have a private water well and you have not done some basic testing, that would be the best starting point. There are many things that can be present in private well water that you don't want to run into reverse osmosis filters (And many other types of filters as well). We can test it for free if you need us to. Just call, e-mail or get onto our website and chat with a live technician. We usually have live techs available up to 14 hours a day on weekdays. They are also available during the weekends with more limited hours. Our chat techs are very nice and helpful. A water analysis (Test) will not only determine whether a water quality problem exists, but it is also necessary to decide the best solution to the problem. The levels of most dissolved compounds and suspended matter present in water, among other things, can be greatly reduced by RO treatment. If you are on a city or municipal water supply, it is always a good idea to call the people you pay the water bill to and ask them how hard the water is. Too much hardness can affect the lifetime of the filters and overall performance. Also, ask them if there are any chloramines or ammonia added to the water. If the answer is YES, be sure to get the 5 stage RO as opposed to the 4 stage RO. If you have any questions or concerns or cannot get this information, just give one of our expert 1 on 1 techs a quick call. They will get you squared away. And don't worry. We keep things honest and simple for you. 4 Stage Reverse Osmosis System for Residential Water Treatment. The efficiency of removal of various contaminants can vary, so you should evaluate this when considering using RO for home water filtration treatment. Other home treatment methods may be better for specific contaminants. It depends on what you are trying to remove. RO systems are typically installed as point-of-use (POU) treatment. They are usually placed at the tap in the kitchen. RO systems come in countertop or under-sink models. A separate faucet is installed with the RO unit so that the treated water can be used for cooking and drinking purposes only. For special cases we also sell WHOLE HOUSE reverse osmosis water purification systems for places that have high sodium in their water (Like people who live near the ocean) or other contaminants that only reverse osmosis can remove, that need to be removed from the whole home.